The Chinese regime is trying to accelerate the capabilities of its defense industry, and this is bad news for democracy and human rights. China is the world’s third largest arms exporter (with the United States in first and Russia in second). The problem with Chinese arms sellers is that they’ve had to find a niche in the global market—and that often means selling to countries that aren’t on good terms with the West. Over the years, Chinese defense firms have been accused of breaking UN embargoes by selling weaponry to countries including North Korea, Iran, and Qaddafi-era Libya. A Feb. 23 story from China’s state-run People’s Daily Online explains the target market of Chinese weapons. It says with China’s new FC-20 fighter jet, in particular, “Developing countries that do not have close military attachments with Western countries will be potential buyers” and they’re targeting countries that fit this description in Asia, Africa, the Middle East, and South America (but don’t specify which). Chinese weapons are often marketed for their low costs, and alleged close capabilities to Western technology. 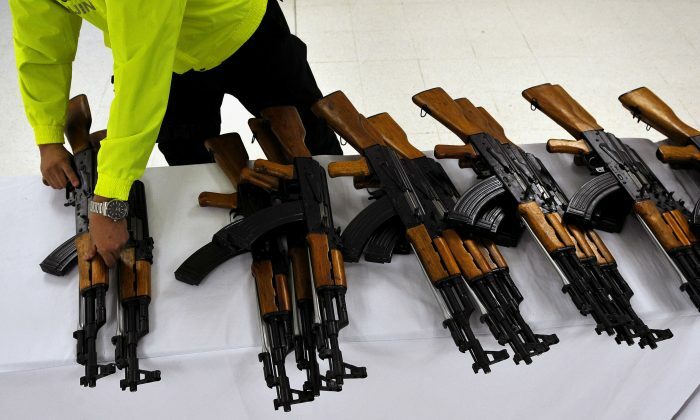 Both of these factors pull from the fact that a large number of Chinese weapons are counterfeits. The U.S. Naval Institute gave a brief overview of China’s cloned weapons last year, noting that China’s J-15 Flying Shark is based on Russia’s Sukhoi Su-33, its J-31 jet pulls from the U.S. F-35B, and the list goes on for everything from unmanned vehicles to tanks, artillery, Humvees, infantry weapons, and other systems. The Chinese regime also isn’t content with staying where they are in the market. Just this month, they’ve announced two major initiatives that will likely accelerate Chinese theft of foreign arms technology, and also get more advanced weapons into countries that aren’t on the best terms with the United States. First, the defense industry in China has been moving to the private sphere—or at least as “private” as they can get in a country with strict arms controls, and where businesses with more than 50 employees are required to have a liaison from the Chinese Communist Party. Second, according to Popular Science, China is starting its own version of the U.S. military’s research and development department, Defense Advanced Research Projects Agency (DARPA)—although the analogy isn’t completely accurate. More than 1,000 private defense companies are now operating in China, which is an increase of 127 percent since 2010. The Chinese “DARPA” will be a committee that seems to be aimed more at oversight than the hands-on work. It will manage defense research and development, promote indigenous innovation, and coordinate how new developments are integrated into the Chinese military. It’s likely that the main focus for developments will still take place in the state-run Chinese arms companies, and through the Chinese regime’s new push for private defense firms. It states that more than 1,000 private defense companies are now operating in China, which is an increase of 127 percent since 2010. The movement is being spearheaded by the State Administration for Science, Technology and Industry for National Defense (SASTIND). This year, it adds, SASTIND will “accelerate” its operations to advance China’s weapons developments and promote the “export-oriented” defense industry.